The Lithium revolution is well underway. If you haven’t jumped on this lucrative bandwagon just yet, there’s still time. In fact, there has never been a better time to invest in lithium-mining companies than right now. Lithium-mining stocks have been on a tear the last few years as demand for the metal in lithium batteries has skyrocketed. Lithium miners, new and old, are ramping up production to meet the new demand. And the best of them are seeing major gains in their stocks. 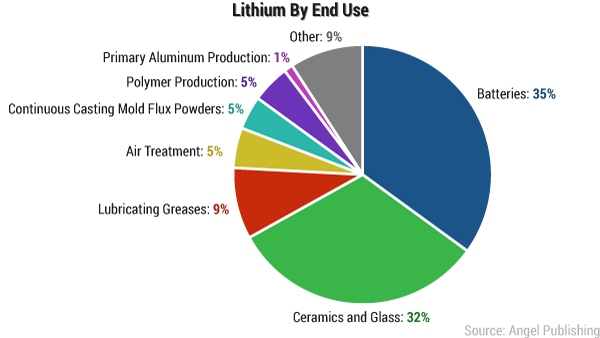 Besides its well-known use in the expanding electric vehicle (EV) market, lithium is also essential for cell phones, laptops, and other electronic devices that require long-lasting battery power. It's also used heavily in ceramics and glass products. The ever-increasing demand for storage capacity is leading some analysts to predict increases in lithium prices for the foreseeable future — which could mean an even bigger jump in lithium-mining companies. Lithium carbonate hovered around $2,000 per ton from 2000 to 2004 but then started rising with demand. By 2009, it was at $5,000 per ton and now stands at more than $9,000. And that’s just where it can be bought cheaply. In 2016, the price of lithium being imported to China briefly touched $21,000 per ton! Today, every company with a single acre in a salt flat or lithium-rich mine is looking to cash in on this trend. Today, we’ll be talking about the big three, which have had a near monopoly on lithium production and prices for years. These three have focused their operations in the “lithium triangle” of South America. This triangle is located between Argentina, Chile, and Bolivia. Of these three, the one that can claim the title of the “Saudi Arabia of lithium” has been a debate for years. Bolivia is home the world’s largest lithium-rich salt flat, the Salar de Uyuni, which is estimated to hold more than half of the world’s known lithium reserves. However, Argentina and Chile are the top destinations for producers that are looking to get in on the lithium game. As of 2016, Chile had the highest brine production in the world with 12,000 metric tons, followed by Argentina with 5,700 metric tons. Titles aside, we’re starting with the biggest producer’s biggest producer: Chilean SQM. Chile is home to Sociedad Química y Minera de Chile S.A., (Chemical and Mining Company of Chile Inc.), the largest lithium-mining company in the world. If you are looking to avoid the volatility of the smaller cap miners, SQM is a safe bet. SQM produces lithium carbonate for use in lubricant greases, lithium batteries, and ceramic glass. Notably, the company’s largest assets are in the Salar de Atacama, or the Atacama Salt Desert. FMC is headquartered in Philadelphia, PA, but its lithium operations are parked right next door to SQM, in the Salar del Hombre Muerto of Argentina. Though the company has its roots in agriculture, early operations in the lithium space have put it among the top producers of the metal to this day. FMC produces lithium compounds for use in air treatment, construction, energy storage, chemicals, glass and ceramics, greases and lubricants, polymers, pool water treatment, and more. In recent years, the company has moved to expand its acreage in the salt flats of Argentina. Albemarle, headquartered in Charlotte, NC, has a unique advantage over both the companies above. After acquiring American lithium company Rockwood Holdings in 2015, the company inherited the Silver Peak lithium mine in Nevada. Nevada is a notable lithium resource not only because of its vast reserves but also because it’s home to the famous Tesla Gigafactory. There, Tesla plans to produce as many as 500,000 battery packs per year and will consume nearly all of today’s annual lithium supply to do it. The company’s CEO, Elon Musk, announced early on that Tesla would be sourcing its materials from North American producers first. And this puts Albemarle in a powerful position. The company also has lithium operations in Kings Mountain, NC, and New Johnsonville, TN. Outside the U.S., Albemarle produces from its assets in the Salar de Atacama in Chile and markets its products all over the world, including in Germany, China, India, Japan, Korea, and Taiwan. 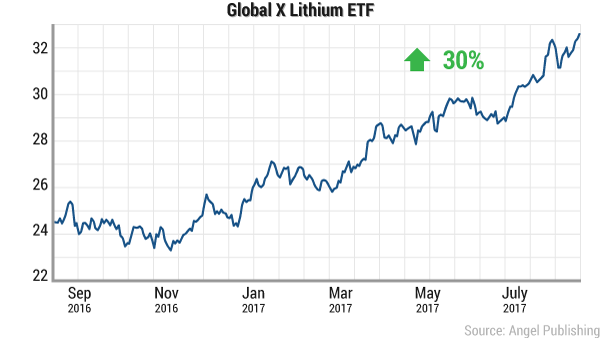 If you'd rather go the ETF route, Global X Lithium & Battery Tech ETF (NYSE: LIT) is your best bet. It’s worth noting that much of the growth in this ETF has come from these three companies alone. 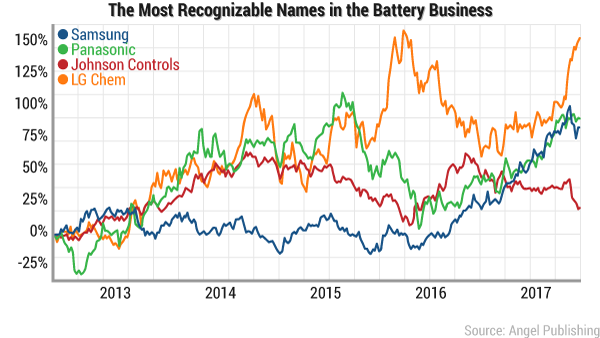 FMC, SQM, and Albemarle are (in that order) the largest lithium-mining holdings in the Global X Lithium & Battery Tech ETF, and they stand alongside many of the battery producers listed above. For a lithium play that's more diversified, LIT is the way to go. Two of the world's most notable investors and businessmen are in an intense feud over the control of a certain lithium supply. We have compiled our research in a video which can be viewed below. View the video presentation right here. If you do not wish to view the video, you can read the written transcript which has all of the research details. You can browse and skim at your own leisure with the written version. You can read that right here. Electric vehicles (EVs) are becoming more and more popular. But there's a dark secret behind them. Jason Williams investigates the consequences of buying an EV and explains why you should hold off for a while. If you've heard of lithium-ion batteries, you've also heard a thing or two about the metal that gives these batteries their name. But there's another metal in this equation that you almost never hear about. Of all the peculiar, exotic financial indicators there are, one of my personal favorites is the Skyscraper Index. This deceptively simple theory postulates the location of the next major economic break down, find out how. Lithium-ion batteries power nearly every portable technology. Here are your best bets in the space today.